FDI, also known as Field Device Integration, is the technical specification that will allow device developers to use a single device package that combines elements of FDT (Field Device Tool) and EDDL (Electronic Device Description Language). Without getting bogged down in acronym soup, all you really need to know is that EDDL is like HTML for intelligent field devices, providing a standard environment for devices to describe what they are, what they can do, and the information they can provide. FDT/DTM is analogous to an application environment that can provide more depth of functionality. FDT/DTM is well suited to handling complex diagnostics and monitoring functions on more complex devices. You can develop FDT frame applications for managing intelligent field devices. Both technologies are widely adopted by suppliers. Both EDDL and FDT technologies are complementary in many ways, and competing in others. Both define how some aspects of device data are displayed. Extensions were made to EDDL (Enhanced EDDL) that now make it do more sophisticated things with graphical displays and more. The history of the two technologies may have played out like the “fieldbus wars” of the 1990s, but both technologies are going to stay and both have good use cases. All the major suppliers now support both. EDDL and its corresponding device descriptions are mandatory for any intelligent field devices developed for FOUNDATION fieldbus, HART, and Profibus, so it’s not going anywhere. FDT/DTM technology has found its way into most plant asset management and intelligent device management applications. What is required is a single device package that combines elements of both FDT and EDDL to speed development time for new products and ease the deployment of intelligent device management in plants. That’s what FDI does. The most crucial part of FDI is the single device package that allows a supplier to develop a FOUNDATION fieldbus device, HART device, or PROFIBUS PA device using a single device package for each protocol, as well as standard hosts. The protocol foundations and organizations will then test and register each FDI-compatible device and/or host according to their specifications. Both EDDL and FDT continue to exist, but things are made easier for device developers and end users spend less time worrying about how to get different technologies to play well with each other and can spend more time actually getting the most out of their applications. Everybody wins. But not without a successful FDI specification. 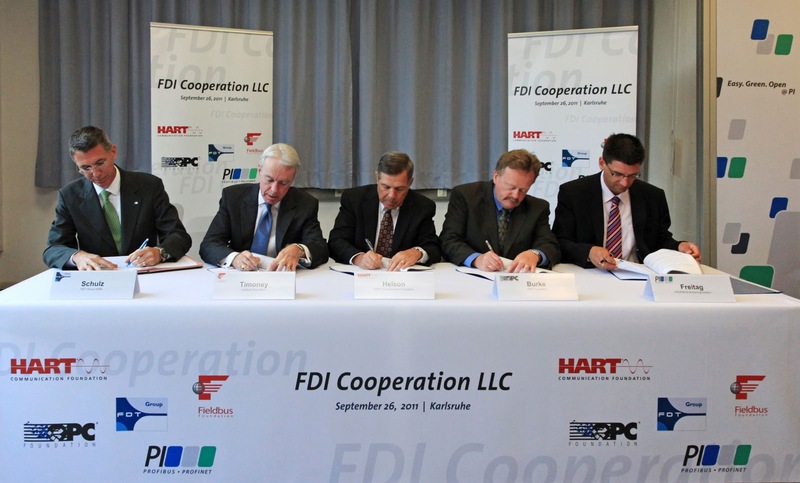 FDI Cooperation LLC is the organization established by the combined efforts of the FDT Group, Fieldbus Foundation, HART Communication Foundation, OPC Foundation, and Profibus International, along with support from most of the major automation suppliers, to see the FDI specification through to completion. This includes not only the single device package but also a facility for OPC integration, an Integrated Development Environment and an application guide. This way, developers have both the specification and the tools to help them develop FDI hosts and devices that fully conform to the standard . You can also view an excellent YouTube video by our own Stephen Mitschke that fully describes FDI and its history. Fieldbus Foundation has also written a white paper about FDI. The first official release of the FDI specification was announced at the recent NAMUR annual meeting. The FDI specification and the latest Electronic Device Description Language (EDDL) specifications were handed over to the International Electrotechnical Commission (IEC) for the next important phase—the Committee Draft for Vote—in the international standardization process. FDI will be included in the emerging standard IEC 62769. You can download version 0.9 of the FDI specification at the FDI Cooperation web site. With the release of the FDI specification, FDI Cooperation demonstrated a preview edition of the common cross protocol Integrated Development Environment (IDE), which will help device manufacturers create FDI Device Packages for Foundation fieldbus, HART and Profibus devices. The purpose of standard developer tools is to ensure that automation suppliers can develop high-quality, reliable FDI-based solutions in a consistent manner. A standard set of developer tools significantly reduces development costs and speeds time to market for both device developers and system developers. There was also a physical demonstration of FDI at the NAMUR meeting. The live demonstration at the NAMUR Annual General Meeting showed FDI functionality in field devices from six different suppliers, all of which are integrated with the help of FDI device packages within a process control system. 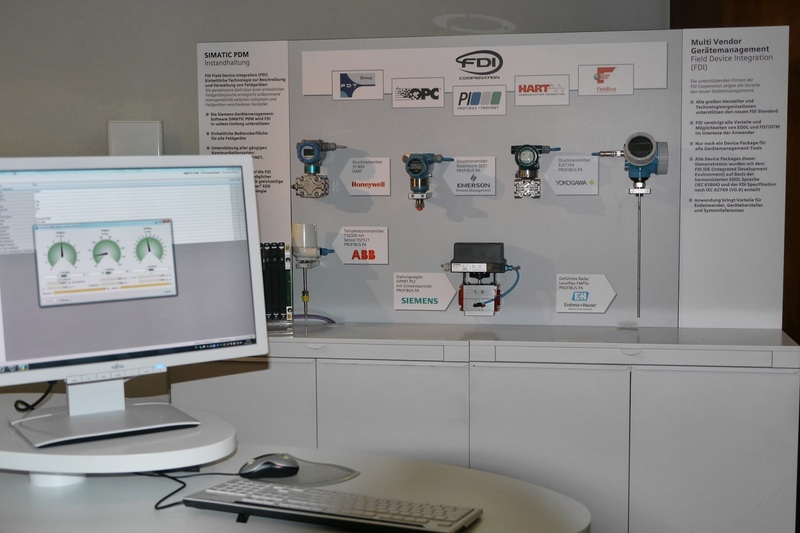 The demonstration, organized and constructed by Siemens, included typical use cases, such as parameter assignment, configuration, diagnostics, functional testing, and maintenance. This was the first time a commercial system based on common components was applied to interpret FDI device packages. The Fieldbus Foundation is pleased to announce the first public release of FDI Cooperation, LLC’s Field Device Integration (FDI) specification and a demo of the FDI developer toolkits, both of which will make it possible for automation suppliers to prepare for developing products and host systems compatible with FDI. The Fieldbus Foundation is one of the founding members of FDI Cooperation, LLC. As part of the release, which coincided with the NAMUR annual meeting, the FDI specification and the latest Electronic Device Description Language (EDDL) specifications were handed over to the International Electrotechnical Commission (IEC) for the next important phase—the Committee Draft for Vote—in the international standardization process. FDI will be included in the emerging standard IEC 62769. At the core of the FDI specification is the FDI Device Package that includes everything a host system needs to integrate an intelligent device. With FDI, a single FDI Device Package that can scale according to the complexities and requirements of each device represents individual instruments. Each FDI Device Package contains a mandatory Device Description (EDD), providing parameter definitions, structure for the parameters for context-specific views, and automated work processes for device procedures such as calibration. FDI Device Packages may also incorporate User Interface Plug-Ins, software components that support advanced device setup and diagnostic functions. Additionally, product manuals, documentation, images, electronic certifications and other attachments may be delivered in the FDI Device Package. The IDE will include a reference host that allows device developers to execute and test FDI Device Package against a standard implementation to ensure product quality. The demo of the developer tools was based on the protocol-independent FDI Common Host Components. Host system manufacturers implement FDI Common Host Components for device management tools, asset management tools, and process automation systems. 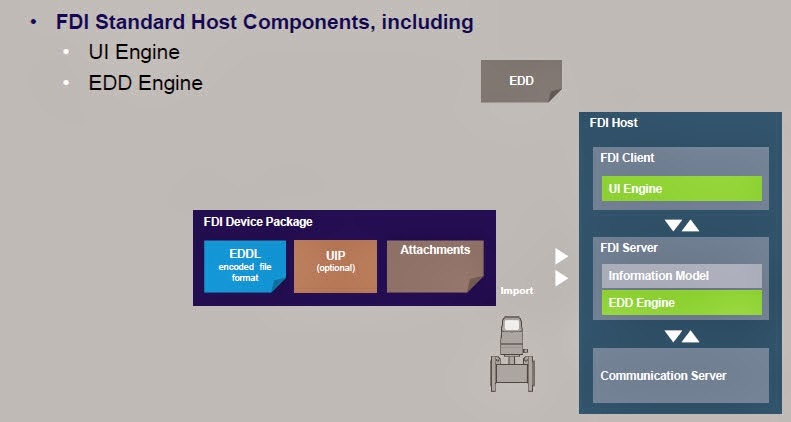 FDI Common Host Components allow for rapid development and ensure FDI Device Packages behave consistently across different systems. FDI Host Components fully support legacy EDD libraries to protect end user investments. The live demonstration at the NAMUR Annual General Meeting showed FDI functionality in field devices from six different suppliers, all of which are integrated with the help of FDI device packages within a process control system. The demonstration, organized and constructed by Siemens, included typical use cases, such as parameter assignment, configuration, diagnostics, functional testing, and maintenance. This was the first time a commercial system based on common components was applied to interpret FDI device packages. The FDI specification will be available for download at http://www.fdi-cooperation.com. In the Spring Edition of our 2013 Fieldbus Report, the Fieldbus Foundation introduced a new series we are calling “People in Fieldbus”. The purposes of this new series is to recognize all of those folks that have worked diligently behind the scenes for years to make FOUNDATION Fieldbus what it is today. Without the hard work and dedication of these people from companies all across the world, FOUNDATION Fieldbus wouldn’t be accepted so widely as it is today. It wouldn’t be as robust or as feature capable. It is easy to forget and let the contributions of those behind the scenes fade away into the ether of our busy schedules, yet it is profoundly important to not let it nor to make light of such accomplishments. The member companies of Fieldbus Foundation have offered great support and resources to our organization throughout the years, and without many of the hard working engineers these companies provide, much of what FOUNDATION users enjoy today would not be possible. Terry Blevins is one of those engineers. Mr. Blevins played an important role in the groundbreaking research of the Interoperable Systems Project (ISP) in the early 1990s and later helped develop the FOUNDATION Fieldbus user layer specification. He has also been extremely instrumental in the continued development and improvement of EDDL through his lead role in working groups. I encourage everyone to take a minute and read this short write-up on Terry from our Spring 2013 Fieldbus Report. The story starts on page 28. We salute you Mr. Blevins and the FOUNDATION fieldbus world thanks you for your hard work and dedication to this field! In its simplest terms, FDI is a converged solution of EDDL and FDT technology. The full realization of FDI requires a focused effort, and that’s why this LLC was created. Part of the effort is EDDL harmonization. FOUNDATION Fieldbus, Profibus, and HART all use EDDL as a common core technology, but each has their own specific implementation of EDDL. The simple logic is that if we get better harmonization of EDDL, it will make it easier to integrate with FDT. You can read about it in this PowerPoint presentation that was given by Achim Laubenstein of ABB at Hanover Fair back in April. Achim is the new Executive Director of FDI and has been active in the fieldbus and FDT world for many years. We look forward to the progress made by the FDI team and will continue to update you. There is an interesting white paper available from EDDL.org (The Electronic Device Description web site) on device revision management. Version management was traditionally a challenge in the early days of digital instrumentation, but the latest version of EDDL makes it much easier to manage different versions of devices. The white paper also provides a good overall tutorial of EDDL.